Rooting the Galaxy S6 and S6 Edge allows you to open a whole new world of possibilities that you can do with your phone. The two majors benefits with root access is that you have the option to install custom ROMS like CM12 and Paranoid Android. Not only that, but you also have the option to use root apps like Titanium Backup and Greenify!! Remember, you can always unroot your Galaxy S6 and S6 Edge simply by following this guide, allowing you to restore it just like the day you first bought the phone. AT&T SM-G920A, AT&T SM-G925A, Verizon SM-G920V, Verizon SM-G925V Galaxy S6 and Galaxy S6 Edge users follow this root guide!! Rooting the Galaxy S6 and S6 Edge is a pretty simple and straight forward process, just follow the guide below to get started! 1. Plug in your phone via microUSB to your computer. 2. Download and transfer UPDATE-SuperSU-v2.46.zip to your phone using the download link below. Just transfer the zip file, DO NOT unzip it! 3. Enter into Download Mode. Power off your phone and then press and hold the power button, volume down, and home button all at the same time. 4. You should “Warning” on the screen. 6. Download Odin3_v3.10.6.zip and TWRP Recovery file using the download links below. TWRP Recovery for Galaxy S6!. TWRP Recovery for Galaxy S6 Edge! 7. Unzip Odin3_v3.10.6.zip and open Odin3 v3.10.6.exe. 8. With your phone still plugged into your computer. You should see a blue box on the left side of Odin that reads something similar to “0:[COM15]”. If you don’t then download and install the Samsung USB drivers and unplug and plug your phone back in. 9. Now click on AP and locate and select the TWRP Recovery TAR file you downloaded in step 6. 10. Click on “Start” and the process will begin. This will only take a few minutes. 11. You will now see “PASS!” on Odin. IMMEDIATELY AFTER press and hold the volume up, homebutton, and power button all at the same time. 12. You will now be entered into TWRP Recovery. 13. Select “Install” > find and select “UPDATE-SuperSU-v2.46.zip” > swipe your finger to install the SuperSU zip file. 14. Now select “Reboot System”. If TWRP Recovery asks you to disable overwriting, allow it. You are now rooted with TWRP custom recovery installed on your Galaxy S6/S6 Edge! 15. You will see an app called SuperSU in your app drawer. Open it and if it asks you to update binary, allow it. You can confirm that your Galaxy S6/S6 Edge is rooted by using an app like Root Checker. 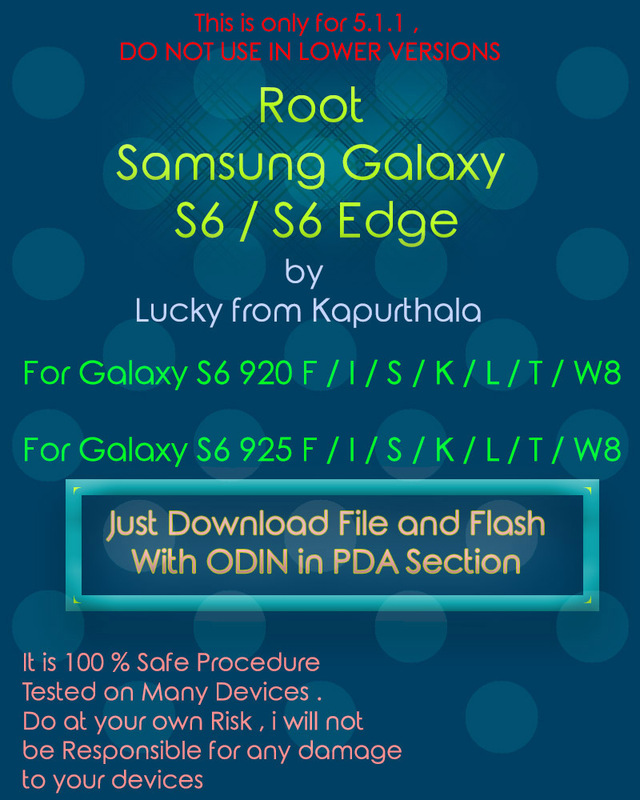 we feel the information How To Root Root 5.1.1 Samsung G925 / G920 Galaxy S6 / S6 Edge 100% Safe that's all. hopefully the information How To Root Root 5.1.1 Samsung G925 / G920 Galaxy S6 / S6 Edge 100% Safe that we have conveyed can provide benefits for you and all visitors of this blog, if any criticism and suggestions please comment. you just read How To Root Root 5.1.1 Samsung G925 / G920 Galaxy S6 / S6 Edge 100% Safe if this article is considered useful and you want to bookmark and share it please use the link https://stephaniefulke.blogspot.com/2015/08/how-to-root-root-511-samsung-g925-g920.html and what if you want other information look for another page in this blog.